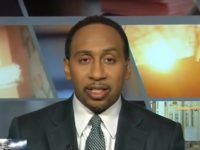 (AP) — Baseball owners have locked down their commissioner and their main broadcast partner, too. 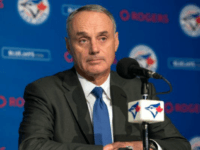 TORONTO (AP) — Baseball Commissioner Rob Manfred is encouraged by pace-of-play changes that have limited mound visits and reduced the time between innings at major league games this season. 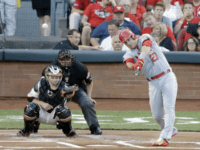 GLENDALE, Ariz. (AP) — Managers or coaches must make a pitching change if they head to the mound for the seventh time in a game under baseball’s new pace of play rules. 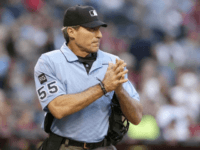 Angel Hernandez, a 55 year old Cuban-born umpire, has filed suit claiming that MLB has racially discriminated against him in their promotion and post-season assignment policy. Major League Baseball Commissioner Rob Manfred issued a statement in regard to a shooting on Wednesday at the Republican congressional baseball practice. 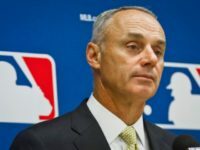 Major League Baseball Commissioner Rob Manfred continues his fixation with speeding up America’s favorite pastime, by aiming to limit replay reviews to two minutes starting this season. 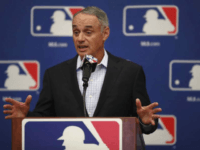 LAKELAND, Fla. (AP) — Commissioner Rob Manfred says he can’t offer a prediction on how likely it is that baseball will be altering the strike zone this season. Baseball’s commissioner has hinted that he may be preparing to try and force the owner of the Cleveland Indians to eliminate the team’s decades old Chief Wahoo logo. 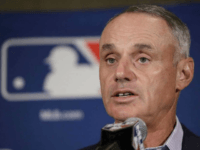 MLB Commissioner Rob Manfred wants to add. 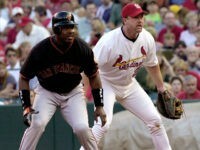 San Diego Padres hitting coach Mark McGwire says he prefers to subtract. In a stunning reversal for major professional sports leagues in America, the once taboo Sin City will likely host the NHL’s 31st franchise, perhaps the NFL’s Raiders, and maybe an MLB team in the not so distant future. 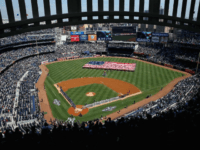 In a visit to the broadcast booth during the Chicago White Sox-Boston Red Sox game, Major League Baseball Commissioner Rob Manfred laid out the timeline for expanding the league and even pinpointed two cities that excite him. Fears over the Zika virus forced Major League Baseball to relocate a planned two-game series from San Juan to Miami. As 22 of 30 Major League Baseball teams start the season equal in the standings at 0-0 today, Commissioner Rob Manfred celebrates the parity that characterizes baseball in the 21st Century. Major League Baseball Commissioner Rob Manfred weighed-in on the debate between traditionalists and the celebrationists. He thinks hot dogs go great with baseball. Major League Baseball suspended newly-acquired New York Yankees closer Aroldis Chapman 30 games under its new domestic-violence disciplinary process. Major League Baseball Commissioner Rob Manfred announced a paid suspension for Colorado Rockies shortstop Jose Reyes. Clayton Kershaw expressed appreciation that Major League Baseball Commissioner Rob Manfred walked back the idea of bringing the designated hitter to the National League. Following in the footsteps of the NFL, the MLB aims to hold its first regular season game in London in 2017. Major League Baseball Commissioner Rob Manfred walked back earlier comments that suggested growing interest in bringing the designated hitter to the National League. Major League Baseball gave teams an extra day to make trades for the upcoming season. 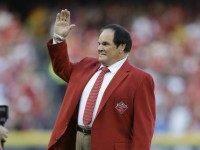 Charlie Hustle’s hustling worked wonders on the baseball field, but his hustling off the field wound up terminating his desperate quest for reinstatement by MLB, as Commissioner Rob Manfred denied Pete Rose’s petition for reinstatement on Monday. 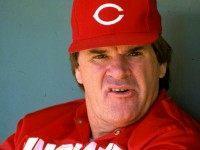 Major League Baseball Commissioner Rob Manfed promises to provide Pete Rose with a decision on his application for reinstatement by the end of December. On the same day Torii Hunter retired, prompting a tweet from former teammate LaTroy Hawkins about the paucity of blacks in major league baseball, Commissioner Rob Manfred spoke of increasing black representation in MLB’s bureaucracy. 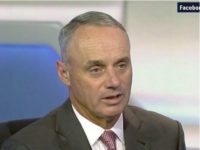 Major League Baseball Commissioner Rob Manfred, ignoring the fact that an MLB rule already addressed collisions between runners and fielders, stated that he ponders a new rule while protesting that such a move received consideration before Chase Utley’s hard slide into Ruben Tejada in Game 2 of the Dodgers-Mets NLDS. On Thursday, Pete Rose found out he may get a huge Christmas present: baseball commissioner Rob Manfred told him that he would decide whether Rose would be reinstated by January 1.